John Douglas Thompson in an upbeat mood during a dialogue in Pittsfield. Giuliano photo. 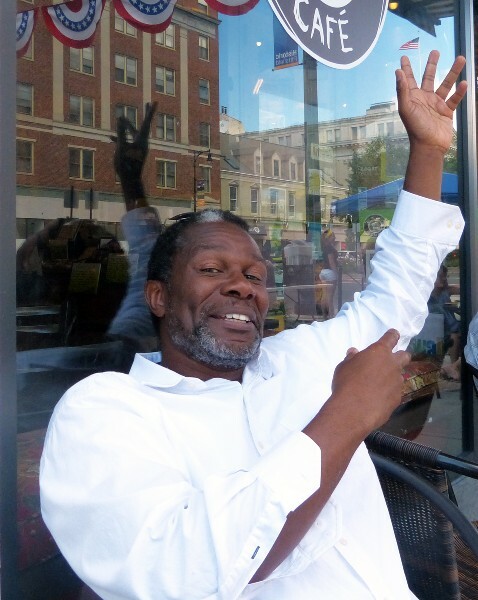 It has been a relatively laid back summer for John Douglas Thompson. He is playing a supporting role as The Cook in Mother Courage and Her Children starring Olympia Dukakis at Shakespeare & Company through August 24. We had lunch in Pittsfield to catch up on his recent roles, including the August Wilson play Joe Turner’s Come and Gone at Mark Taper Forum in Los Angeles. It is the play that inspired him to pursue a career in theatre. Immediately after Mother Courage he starts rehearsals for a Broadway production of A Time to Kill based on a novel by John Grisham. It features the Broadway debut of Tom Skerritt. That runs through March when he stars in Satchmo at the Waldorf by Terry Teachout which premiered at Shakespeare & Company. That runs Off Broadway through August followed by rehearsals for Christopher Marlowe’s Tamburlaine the Great at New York’s Theatre for a New Audience. That is followed in January 2015 with a BAM then Broadway restaging of the Robert Falls, Goodman Theatre production of O’Neill’s The Iceman Cometh. Charles Giuliano There has never been an August Wilson play in the Berkshires. This season you starred in Joe Turner’s Come and Gone at the Mark Taper Forum in Los Angeles. Our contributor Jack Lyons reviewed it for us. We have had amazing traffic on that piece which continues to get hits. John Douglas Thompson I met him with his wife after a preview performance. He said that he was a contributor to your site. CG We get hits on your Hartford show Antony and Cleopatra. JDT It seems like that was so long ago. Like three years. There was a time when I did Richard III, Antony and Cleopatra then Macbeth all in a row with a few days off between each production. I can’t believe I did that. It’s enough Shakespeare for a career. In a sense, those three great roles. And I did them in the space of six months. Two months for each. What was I thinking? CG How important in the arc of your career was doing Joe Turner? That was the play that inspired you to pursue a career in theatre when you saw it at Yale Rep.
JDT It’s the role that made me want to be an actor. It was a dream come true because I thought I would never have a chance to do it. I thought I was getting too long in the tooth to play Herald Loomis. As Wilson wrote him he’s 32-years-old. When I was out there playing him I went from 49 to 50. We went up May 8 and my birthday was May 28. Obviously, age-wise, I’m too old to play the character. I knew that going into it that I might never get the opportunity to play it because I’m too old now. So I was very thankful when Phylicia RashÄd asked me to be in the production. To play Herald Loomis. It was a full circle event for me in my life. It’s part of my own personal mythology. The whole event of going to that play. The date that didn’t show up. Going to the play myself. Seeing this work was perhaps the second or third play I had seen in my life. Being so profoundly moved by the story. The nobility of all these African Americans on stage; all at once in the same play. CG How old were you at the time? JDT I believe I was anywhere between 25 and 28. CG You were a businessman driving around in a Mercedes. JDT Pretty much. That was me. CG That’s something to leave behind in order to pursue a career in theatre. JDT Now that I look back on it I wouldn’t have lasted in that career as a corporate sale person too long. Now that I look back on what I’ve done as an actor in this stage of my life I can certainly say that I made the right choice. Maybe the writing was on the wall and I didn’t see it. I had romanticized this play in my mind over and over and over again. When and if I get a chance to be in it. My biggest challenge when I got the role was moving away from romanticizing it; the play and the character and the role. And start to do the hard work of understanding the character and truly understanding the play. Understanding what August Wilson was trying to get across to the audience. It was really really hard for me. It didn’t turn out the way I had been fantasizing about it. Thank God I had Phylicia RashÄd. She guided me through this maze. It’s one of those roles you could so easily turn into anger. You’re very upset about what’s happened to you in your life. You hate people. You hate everybody. You hate yourself so all that comes out of you is pure anger because of the situation. She was there as a faithful guide to direct me to some vulnerable aspects of the character, which really helped me. CG You were at American Repertory Theatre during the time when Robert Brustein was having an epic feud with August Wilson. JDT I was. I’m very good friends with Robert Brustein. He’s been a big supporter of my career. He got me leading roles at A.R.T. He put me in some wonderful positions. As a matter of fact I just won the Robert Brustein Award. I picked it up a few months ago and it was awarded for my body of work in theatre. The award is given each year to an individual in recognition of a contribution to the craft. I was stunned to get such a prestigious award that has his name on it. For the little bit of work I feel I’ve done. CG You did Merchant of Venice for Brustein. JDT No. I did Othello at A.R.T. Also The Brothers Karamazov, Mother Courage, Marat/ Sade, Winter's Tale, Ohio State Murders and a Charles Mee play Full Circle. He got me a lot of roles and helped to develop me as a lead actor. CG Today, Wilson is widely viewed as a monument of his era in American theatre. It is sad to think of those creative titans feuding. JDT They both had very strong points. At the time there weren’t many opportunities for African American actors to work steadily and August Wilson helped to create that. CG That’s what inspired you when you first saw his play. JDT Not just that he created opportunities but here was this beautiful poetic play about African Americans’ lives. I found it so profound and moving. The whole mystical and spiritual aspect of the play really rocked me. It got under my skin in a way that no other play has since. I felt the production I did at Mark Taper Forum was a good production and I’m very proud of it. This may have been my proudest moment. Here I am playing Herald Loomis in a wonderful production of Joe Turner’s Come and Gone, this play that is at the axis of everything that I’ve done since I started acting. CG Let’s talk about your calendar. What happens after Mother Courage (Shakespeare & Company)? JDT We finish August 24. There’s a travel day then I begin rehearsals for A Time to Kill on the 26th. It opens (on Broadway) in October and goes to March 2. At the end of that, when it’s done, I start doing Satchmo at the Waldorf a New York production of Satchmo. When that comes down, it runs from mid March to August, then I have Tamburlaine Parts One and Part Two with Michael Boyd, the former artistic director of the Royal Shakespeare Company at Theatre for a New Audience. I’ve done a lot of contemporary plays over the last three years. I haven’t touched Shakespeare/ classical text in almost two years now. I’m jonesing to get my hands on verse. I am. The Wilson was great. He got to me because Wilson took over where Shakespeare left off. I feel like I’m playing in the same ballpark. After that it made me want to do Shakespeare or some verse language even more. CG At this point how many productions of Satchmo have there been including the premiere at Shakespeare & Company last summer? JDT There have been three so we have done a total of 90 shows. After S&Co., Long Wharf, then the Wilma Theatre in Philadelphia. There have been 90 plus performances. CG What shape is it in? JDT It’s in great shape. We will probably do a little more tweaking before we do it in New York. CG What’s happening with Miles (Davis)? JDT Well, he’s got those two scenes man. He’s still bitter. That’s what’s happening with Miles. He hasn’t lost his edge. Working on it with Gordon Edelstein the artistic director of Loing Wharf and Terry Teachout (Wall Street Journal theatre critic and playwright) being the great writer that he is was willing to make changes. He was willing to bring other things in as long as it was honest and factual. Gordon said “We’ve gottah have Miles Davis in there.” He wasn’t in the play. He wasn’t there at all. I remember me and Terry going “What?” Gordon kept insisting “We have to have this detractor. We have to have this guy who’s putting so much pressure on Armstrong. Terry researched and found things that Miles said, word for word, relating back to Armstrong. He wrote it into the play. It was my job to memorize it and then perform it. It turned out to be a special aspect of the play. People loved it. CG How important is it to S&Co. to have a play that they premiered move on to New York? JDT Tina (Packer) brought her Women of Will into New York. That was significant and did well. It’s about creating product, and this has always been a goal of mine with the company, and certainly with the board that I sit on, to create something that we can export to New York. To take something from here that’s ready for New York audiences. This is the second production to do that so we’re building a path. Hopefully it brings name recognition by getting the company exposure in New York. Several of the companies here (Berkshires) have already taken that path. So we’re late coming to that party. If we get Satchmo in there, which I know we will, I think we’ll stay at the party for a long time. CG Does S&Co. get a percentage of the New York production? JDT I’m sure but I don’t know how those contractual arrangements work. You should talk to Tony (Simotes) about that. We created it along with Long Wharf. Both Long Wharf and S&Co. are going into this venture together. There are several parties raising money for the production. I think we have a good show and will continue to work on it. I think people will come to the play because it’s about Armstrong. When I did the play here and at Long Wharf I didn’t fully understand how beloved Louis Armstrong was. Even to this very day. When people hear that there’s something going on about him. Whether it’s a band playing his music, book, a movie, a documentary or a play people show up. In that sense it’s good. I don’t know if there’s another play that’s out there about Armstrong. Maybe there are. Maybe there’s a few. I don’t know. CG How does Terry’s status as a Wall Street Journal critic play into this? One might look at it as a positive or a negative. JDT There are probably both sides. On one hand he’s a critic but he’s also a playwright. CG There’s going to be a certain kind of attention for that. JDT I think that’s only going to be good. Everything has a plus and a minus. That’s pretty much life. CG To what extent will this be an event in the coming theatre season? JDT We hope so. We’ll do all that we can to make that a reality. At the end of the day you really don’t know. I work as hard as I can and prepare as much as I can then leave the rest up to God. CG Summarizing, it appears that your calendar is full for the coming year. JDT There’s A Time to Kill, Satchmo, Tamburlaine then The Iceman Cometh. CG Iceman? (The Robert Falls production at Goodman Theatre in Chicago). I thought that fell through. Where is it going? JDT BAM (Brooklyn Academy of Music) then Broadway. It did fall through at first but now it’s come back. It’s happening January, 2015. CG I thought they had tried but decided that it was too long for Broadway. JDT They came back and pushed some more and figured it out. It’s going to happen. I have seen many things which have gone from BAM to Broadway. The Macbeth that Patrick Stewart did I saw originally at BAM. Then, two weeks later, I saw it on Broadway. They do that often. CG Are we talking about the Chicago cast with Nathan Lane and Brian Dennehy? JDT Yes with most of the original cast including Stephen Ouimette who played Harry Hope. It’s a remount of what you saw in Chicago. There may be some people who can’t make it. They will be recast and we’ll do it. CG The show is what, four hours? JDT A little over four hours. You sat there. CG Tell me about it. JDT People I talked to after the show said it didn’t seem like four hours at all. They were so engaged by the story and characters. It’s O’Neill, let’s face it man. I think it can have a great run on Broadway. It’s different and a bit longer by some 45 minutes than the Kevin Spacey Iceman. You saw the Goodman production. There’s no argument that it’s a great production of Iceman Cometh. "Following John Douglas Thompson's career with you has been a real treat, Charles. I thought the Chicago Iceman was great and look forward to seeing it at BAM. "